A friend of the ministry kindly created this Spotify tutorial for you so that you can enjoy the music that we speak of here in membership as well as share the music of the composer study with your children. Spotify is a free or paid program that allows you to listen to music on demand, instead of simply a requested style of music. There are two different ways to use Spotify – on a computer, or as an app on a mobile device. I usually use my phone because it travels with me. You will first need to download from Spotify.com or from your app store. You will need to set up an account, and you may want the premium version. This allows you to play any track you want, download songs to listen to offline (great for in the car! ), listen ad-free, and more. There are a few different options – student, individual, and family – pick what works best for you or stick with the basic free version. 1. Using the search bar, look for an artist you like and click “Follow” – this will add them to your list of artists in Your Library. With classical artists, this is a bit trickier as their songs are all performed by modern artists. 2. You can also save individual albums in the same way into Your Library – either by searching for the album itself or by clicking on it from the artist’s page and clicking on the “save” option on the top. 3. 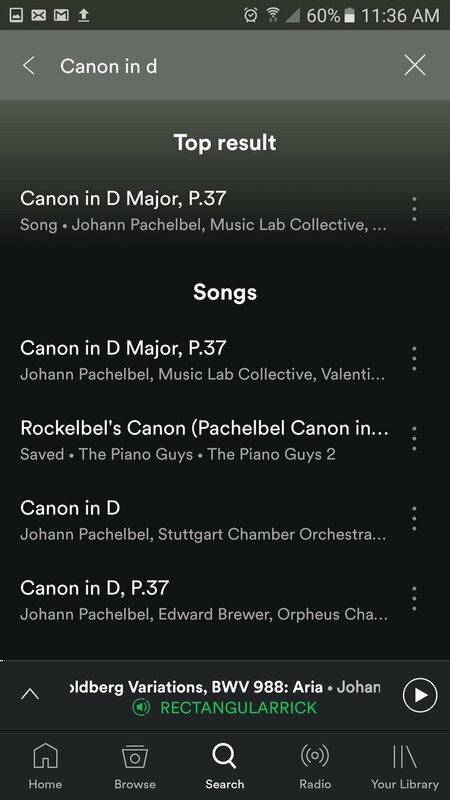 If you are looking for a specific song, like Pachebel’s Canon in D, you can type “Canon in D” in your search bar and you will get many different recordings of the song. 4. Another feature I like to use is the playlists. You can create as many playlists as you want and add songs to them. To save a song to a playlist, navigate to that song and click on the little 3-dots menu thing on the far right and click on “Add to Playlist.” Then you can select if you want to put it in an existing playlist or add a new one. 1. Downloading! When on a wi-fi network, you can download songs, albums, playlists (or entire audiobooks!) to listen to when you don’t have mobile network (or don’t want to use up your data). We use this a lot in the car and even camping with a little portable speaker. 2. Radio. Like the Pandora of old, you can still listen to music by genre, and there are many Christian radio genre options. 3. Suggested songs. When you are listening to a playlist you created and it finishes, it will continue playing songs that are similar to the ones you’ve been listening to. This has been a fun way for me to discover new songs that I like! 5. Your Daily Mix. On the top of the Your Library tab, you will see “Your Daily Mix.” In here are a few collections of music based on what you listen to most. Another fun way to discover new songs. There’s much more to explore on Spotify, but this will get you started. Have fun listening and exploring new music with your family!